My job often puts me in the proximity of celebrities in all shapes and forms. According to the laws of irony, anyone who is crazy about celebs will probably never get to meet one. The reverse is also true. I’ve been so uncrazy about famous people (since passing my teenage years) that very few of them can get me excited. When I got a two-hour notice to interview Vick Teo, I didn’t have time to do any research. Not that this is an unusual phenomena. Fortunately, I’ve actually paid enough attention to know who Vick Teo is and one or two things he’s done this year. 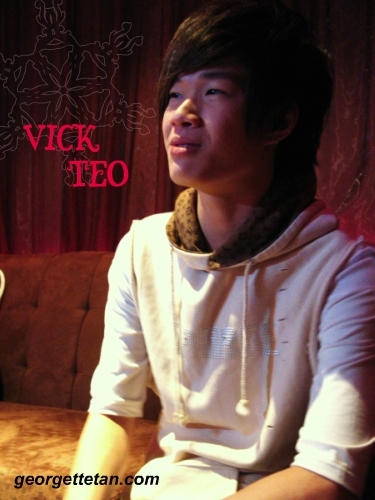 Vick is very personable and easy to talk to, and was very nice about repeating himself in both English and Chinese. Of the two reporters present, one isn’t too good in English, and the other doesn’t understand any Mandarin! After that interview, I am very pleased to have met him, and delighted to learn that he also can’t go to sleep without spending some quality time with a book first. He is currently reading Lizzie’s Story by Stephen King, and just finished rereading HP7. For the rest of the story, you’ll just have to look out for my article in PostMag next month! We had Vick pose for photos after the interview. Since we did it on the 2nd Floor of Crown Square, excited passerbys recognised him and had their photos taken with him. One of the organisers asked if I wanted my photo taken with Vick. I said there is no need. I’ve always felt that the reason people like having their photos taken with celebs is to prove to their friends (and themselves!) that they actually met the person. I like staying behind the camera, and I’m content to take photos of them instead of with them. I don’t need to prove to anyone that I met Big Star X. The most obvious reason is because my article on them is proof enough. The other reason is that it is enough for me to have met them, spoken to them, and if I really mean it, tell them that I enjoy their work. That’s just me. I leave the camwhoring to Ducky (whom I didn’t bring yesterday due to the last minuteness). left Ducky behind! how will we Ducky junkies live? merry xmas georgette and ducky! hi where can i find your article in postmag? tried googling but coudn’t find anything! jordan: Postmag isn’t online, but I can repost it here if people ask.